I haven’t played too many D&D games for the list recently. Games like Baldur’s Gate defined my taste in games, but after we covered some of them, I’ve left Eye of the Beholder until later. I believe it’s the last one, but as a first person dungeon crawler, it’s still different from the isometric Infinity Engine games we played before. 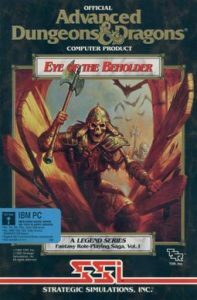 It feels like Eye of the Beholder is one of the examplars of SSI’s long reign of D&D games. It’s not the first, but it put Westwood on the map and their Lands of Lore series was as big as the Command & Conquer series became. Would we have had that without this game? Possibly the first and biggest takeaway I got from this game is how much it felt like a D&D campaign. Maybe not the roleplaying “you all meet in a tavern” bits, or other city exploration, but going into a dungeon, finding your way around, fighting enemies, solving puzzles and looting as you accomplish your goal. Eye of the Beholder takes place in a single large dungeon and it has quite a bit to offer on each floor. This is still also an early D&D dungeon crawl, so the floors aren’t necessarily all fair – without a thief, I believe there might be a dead man walking scenario or two and there are some traps that feel like they kill for minor mistakes – possibly even without much to avoid it. I got a Tomb of Horrors feel from it – you are there to be challenged on that level. The game expects you to map throughout. While there are some unique sections, the environment textures are repeated through a level and it’s easy to get confused with where you are. The first level loops through some corridors that I get confused by, and the second level introduces tiles that turn you around, without immediately being obvious. There’s something authentic to this too, but I miss the bulk “this is a 20 feet corridor” that summarizes it all. The other thing that adds to the feeling of an authentic D&D campaign is the amount of interactivity. Objects have weight, to use with pressure plates, and there’s an early puzzle involving daggers thrown through bars. It’s a bit prescripted, but it’s an interesting touch that creates some extra challenges and out of the box thinking. Combat is optimized from its paper and pencil roots, as you would expect in a game, and basically comes down to pressing buttons to attack when they’re available. There’s a more complex system for spells, but that’s because, well, we’ve got spells. There aren’t as many natural moments to rest, but so far it’s not been too difficult, it feels like the traps have been more lethal than combat so far. The other downside is that if a character dies, you don’t have a way to raise the dead early on, or a way to replace party members. I’m told that these follow later, but so far I just saved and reloaded more often. It’s probably the most awkward bit in the game. Given the constraints, this feels like what I would have wanted from a D&D game in the early 90s. There’s a lot of trial and error, but it’d be as close as I could get to the real thing while being on the computer. Now, the standards have obviously evolved, and I would want to keep a walkthrough around at all times, but it’s still more enjoyable than plenty of other tries at the genre.